I’m happy to introduce you to my newest sponsor, Jones & Vandermeer! This great shop offers up a wide selection of beautiful fabrics (as well as yarns, buttons, beads and ribbons). I love shops that carry unique items, and this one certainly fits the bill. Not only do they carry great items, but they write such great descriptions for all their products! I love browsing the new arrivals for fun new fabrics I might not find elsewhere. My most recent order included the fabrics above – the middle print is one of my current favorite Liberty of London prints, and those on either side are new Yuwa Botanical Study prints. I particularly love that coffee color shown at the bottom. Don’t they look great together? They’d make a good start towards putting together a color scheme similar to Hazel’s patchwork quilt. I also picked up a fat quarter pack of these new Sevenberry Neons. Fun, right? I love the contrast of the neons on the nice cotton/linen background. And I usually can’t resist checking out the ribbons and buttons. 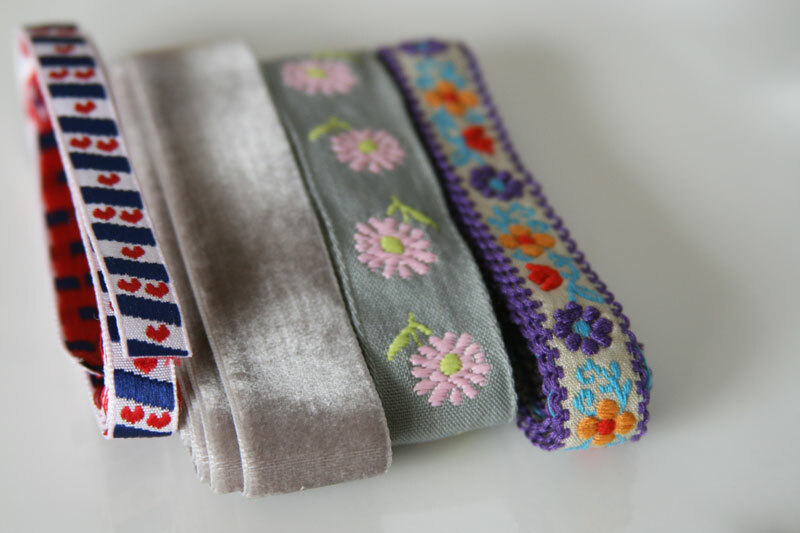 I don’t have plans for these ribbons yet, but they were too pretty to resist. Want to win some of those neons? Jones & Vandermeer is kindly offering up a fat quarter bundle to one lucky commenter. 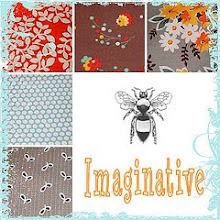 Please leave a comment here telling me what you’d make out of these great fabrics (I don’t have plans for mine yet, so ideas would be welcome!). I’ll select a winner on Sunday evening. And in the meantime I hope you’ll take a little peek at the Jones & Vandermeer shop – I have a feeling you’ll find something you love! Update! Random.org selected number 97, Kim, who thinks these neons would look great in a modern quilt. I agree with her! Hopefully Kim will be able to put these great fabrics to good use! This entry was posted in Fabric, Giveaway! and tagged fabric shop, Giveaway!, jones & vandermeer, liberty of london, sevenberry, sponsored giveaway, yuwa. Bookmark the permalink. just found out about 2 babies expected to arrive in 2014 and every baby needs a quilt. Thanks for a great giveaway. I would make a messenger bag and use the leftover fabric for pouches. This is a great store and I have purchased some great items here. Thanks for the giveaway. Thanks for the introduction! Lovely fabrics and they have pretty yarns, too. Wow, not sure what I would make, but there’s lots of inspiration on your site! What beautiful quilts you make! Great neon fabrics. Bet they would make great fabric buckets. How fun would that be! Hmm…. probably pouches, or cute linings for inset pockets! i would make a few zip up cases with the neon fabric. A fun gymbag would be my idea. Great fabrics! I would love to win!! OMG they are amazing. I want to make things for my little girl. A bag, pencil roll all sorts of things. I would make some small zippered bags for traveling. Thanks! Oh those neons are great. I love how they look against the linen. Maybe a bag? For a Christmas present? Thanks for the giveaway! I would love to make a bag out of this fabric! I would use them to make e-reader sleeves. Thanks for the giveaway! I think I would make some small bags–perhaps frame purses? Ooh I love these! I love the idea of zipper pouches or an iPad case. Or a patchwork pillow! I may actually be in live with these! I love love love things that juxtapose neon and natural. I think I’d make a cute bunny doll using the dotted fabric for the body and the gingham one for the pads of the feet and the insides of the ears. These are really different! Thanks for the introduction to Jones and Vandermeer. I would practice on some other fabrics first and then make my first fabric boxes/storage bowls out of the neon-naturals. These would make a cute purse! Those would make a cool modern quilt! Thanks for the chance! Cute fabric! I would love to make some fun pencil cases and journal covers with this for my nieces! thanks! I’m always up for making pillow covers! I would make something for my teenage niece. She loves the neon colors. I’d make an awesome bag for my work things or a fun summer scarf or 2! I think that I would make a cool sunglasses case for my new sunnies! I need a new kitchen set–dish towels, apron, oven mitts, etc. I love neon so much right now! I’m super boring, so I would probably make a set of simple napkins. I would use these to make myself a new kindle cover! I might also use some to make some hair bows for my nieces and my friend’s twin girls. Great fabrics – how about a picnic quilt??? They would definitely be a baby quilt. Not sure what pattern…. They would definitely go into a lap quilt esp since I’m not a garment or bag sew-er. Those would make a supah-sweet diaper tote. Nice! Love the Yuwa Botanical Study prints! I think I will make a drawstring bag. These would be great for accessories. Like a hat, tote bag, etc. Such cute fabrics. I think they would make a great tote! So pretty! I am planning on making pouches for Christmas gifts this year and these FQs would make beautiful ones! A Low Volume mini with those lovely botanical prints? Have a picture right in my mind……. Zipper pouches or skirts for my girls! I think I would use these for a quilt, with lots of neutral solids to tone down the bright neon. I’m completely into neon everything right now and this fabric is probably going to have to live with me one way or another. A cute bag would be a lot of fun. I need a Kindle cover…badly. So that pink neon cross/plaid-ish print would be stellar with some fussy-cuts around it. Those neons are so cool! I think I would sneak them in with some other fabrics for a fun pop of color. I need a new laptop bag, and these would work beautifully for that! A bag for sure. These neons are adorable! I think those neons have to go into a cushion cover or set of placemats — thanks! The fabrics would be a good start for a baby quilt. Thanks for the giveaway! Pieced travel bags…the luggage kind with lots of interfacing and zippers! I have a pattern for placemats – 4 FQs makes 4 placemats. That our charity project for December for our quilt guild. I definitely see a little clutch or handbag from this. So cute and bright and fun. Ooooo I’m totally seeing a vintage style little girl’s pinnafore. Something that would be totally updated in these neons and still classicly cute. I would whip up a few zip pouches, or an apron. Hard to choose! I LOVE those neons! I’d have to make something cute for my daughter. Maybe a nice full skirt or something. Oh my gosh I love those neons. I don’t know what I would make, I guess I am in the same boat as you lol. Thanks for the giveaway. I’m thinking, maybe, a cute little bag of some sort! I think they are screaming out to be made into some awesome makeup/pencil cases! Would it be boring to say I’d make a quilt?! I love those! They would be great to use for shopping bags. I think I would make some zip pouches with that fun neon fabric! I love it! Thanks for the chance to win! I don’t normally go for the neons, but the non-white background is making me think these would be cute as strips in a skirt with more of that neutral color for the rest. I’d make some patchwork floor cushions for my daughters’ room. They would love them! Little baby pants with contrasting roll up cuffs or maybe a sun hat! The babies would really stand out in the crowd! they would make a cute scalloped bunting for my daughters room. I need a new tote! I know I’d make some sort of bag. Super fun — thanks!! I’d either make a patchwork skirt for my little girl or a tote for a Christmas gift! I think they would make fun linen napkins. There’s a great tutorial over here : http://filminthefridge.com/2008/11/19/make-your-table-pretty-a-reversible-rick-rack-napkin-tutorial/ ha! ha! They would make some nice reusable bags for the store! Thanks for the chance! Those are begging to be made into snazzy college dorm wall hangings to grace my daughters room in Iowa City! Thanks! I’d make a bag for my laptop with these, thanks for the chance to win! 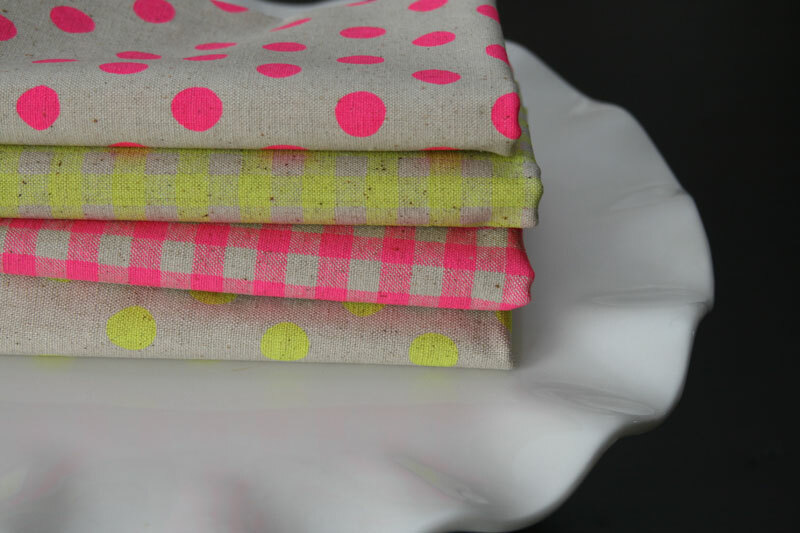 Love the combination of neon with the linen look background… Project possibilities seem endless! Baby quilt is the easy 1st choice. Thanks for the giveaway. A NEW TABLE RUNNER IS COMING UP SOON! Those fabrics would make an amazing clutch! Perfect to add a pop of color to any outfit. Thanks! Those neons are wild! I love them! I can just picture the best fit-and-flare dress out of them! These are crying out to be made into cushions to perk up my dull beige sofa! Thanks for another great giveaway. I don’t know what I’d make, but it would definitely be for me! They would make adorable baby bibs for gifts! These could look awesome in a modern quilt! I think that I’d make a bag! I’d make a cushion for my daughter’s bedroom. She’s just turned 14 and adores bright splashes of colour like those glorious fabrics. I would definitely be making a tote with these. They are lovely! I’m thinking pillows/cases for sure! It would be the first thing I actually made that stayed at my house! I have just been asked to make a quilt for a teenage girl – this will fit in perfectly!! Love the Yuwa Bunnies and the Liberty Tresco that Jones and Vandemeer stock. I will definitely have to do some shopping! Thanks for the opportunity. What a cute shop! I think I would *finally* make some floor pillows for the kids’ room! Would love to make a quilt with these! Patchwork pillows! The linen tones down the neon, I think, without making it too boring. I’d make a tote bag – bright & happy. Thanks. I’d love to have a fun tote in those bright neons. Thanks for the chance! Those neons would make a great tote bag or zippered pouch! Those neons are great – so different. I think that they would look fab turned into cushions on my sofa to give it a pop of colour. A tote for lugging quilts to Show & Tell. 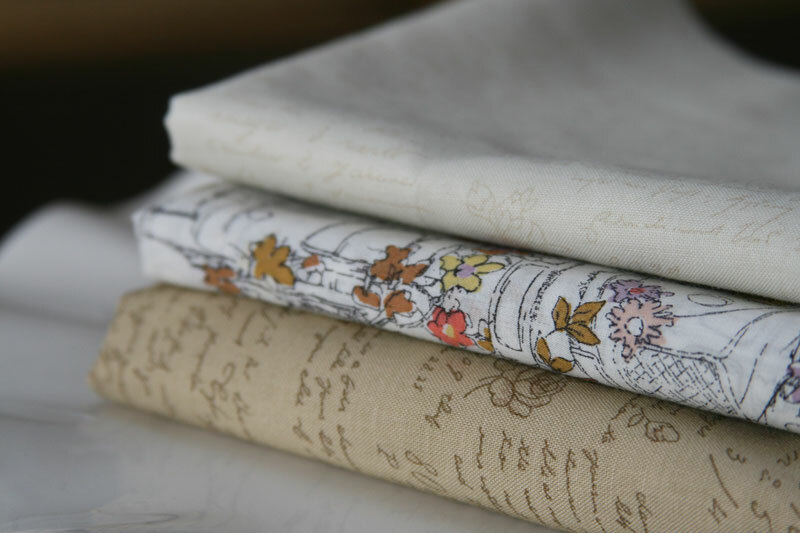 love these linen cotton blends! I would add the to some cottons, and make pillows. Than you for this chance. I would love to win some of the neons. How fun! Cute neons! I think they’d make cute lunch or tote bags. I think I’d have to make a purse/bag of some kind. Those fabrics are just to cool not to carry around with you! wow–that first stack with the Liberty print and the Botanicals is to die for. Love them all and will check out your new sponsor for sure to get some for myself in case I don’t win :-). I usually make quilts but these fabrics would be fun to slip into small bags or pillow covers. Thank you for sharing! Oooh, I’d probably make some little pouches and fabric buckets with those neon fabrics! I am thinking some patchwork pillows! I have a customer who asked me to make a pink bag. I have really been dragging my feet because pink is not my favorite, but when I saw this pink on the linen I fell in love! I can think of a lot of projects to use that on. I’d love a great clutch out of those neons! Well, I think I would give it to my granddaughter who is 10 and learning to sew. Perfect for her. These fabrics are GREAT! I would have such a hard time deciding what to make though…maybe some zippered pouches for gifts (Christmas is coming!!!) or maybe some pillows or a cute little bag or even a tiny little doll quilt! So many ideas. neon zipper pouches! thanks for the chance. Make some pouches for thank you gifts. These are gorgeous – such fun colors and such beautiful fabric! Oh my! I’d make myself a cute neon lap quilt for the office. Thanks for the giveaway! These are so cute! I love the idea someone gave about fabric buckets! I’d use this bundle for a bag. I’d be right on trend for one of the first times in my life. I have been a fan of Jones and Vandermeer for some time. Love the neons and thank you for the contest. I would love to make a plus quilt out of those fabrics. Oh these fabrics are so perfect for a new sleep over bag for my 7 year old little girl! Neon colored items are the new hot thing in school aged kids these days. My so. And daughter bot are all into the neon stuff! I love the neon with the linen look.. so refreshing! I am thinking they would make a cute back pack for my grand daughter. And I am sure there would be enough for me to make a zipper tote to take my keys and cell phone when I’m going to meetings. OOh, and a mug rug! Thanks for introducing Jones and Vandermeer. I would use the neon fabrics to make fabric baskets and zipper pouches. Thanks for the chance to win! These would make a cute summer hat or picnic tote! I have a new pattern that uses fat quarters I am itching to make! These gorgeous Jones & Vandermeer neons are crying out to be made into a vibrant, modern cot quilt. I think those would make very fun napkins! I think these amazing fabrics would find their way into a fun tote bag. I absolutely love them!!! Oh, those neons look like so much fun. What would I make? I am not sure, but I am leaning toward a bag or basket. I’ll decide once I get to feel it and scrunch it. Thanks for the delightful giveaway. Love those neons and the ribbons. Great variety of textiles. I look forward to checking out their yarns. They are begging to become some fun outdoor picnic table mats and napkins I say!!! I know a couple of newborn twin girls that could use some accessories made with that sweet fabric! Those fabrics are brightening my dreary, rainy, cold fall day. I would make a small quilted purse for spring. Gosh, they are fabulous! I think definitely a bag for my five year old. And a pillow cover. They are so so pretty! I might use them for a tablet sleeve or a bag or a quilt….too many possibilities. Such fun fabrics! I think my daughter would be very happy if I made here a messenger bag. They’d make great festive napkins! I’d love to make some cushion/pillow covers with these gorgeous fabrics. Thanks for the chance to win. How cute! I agree with you, I love the neon with the linen background. I would sew up a couple of little make up bags for my daughter. I would make a baby quilt and some oven mitts if I won. wow – just the intro to this shop was a huge gift – I’ve already ordered some Yuwa Suzuko Koseki fabric! I think I would use this bundle to make some adorable softies for my granddaughter – the colors are perfect to embellish and just make me smile. thanks again for the amazing intro!!!!!! A tote bag for sure! I’d love to make a large tote bag! Love this fabric!!! I think I’d make a baby quilt! I would make a tablet cover. It would be really cool!!! I’d use them with florals for a baby girl quilt. Great fabrics! I have a niece that would love anything made from this bright fabrics. Thanks for the chance to win. I would definitely make something for my granddaughter. WOW, love those fabrics! Beautiful. I would make a small play mat for my granddaughter. She loves the dots in any prints (paper or fabric). She would love to see those fabrics. ANd while she is lying on the mat , I would enjoy looking at it too! Oh, great fabrics! I just got a cute little bag pattern called Suzy’s Sack…these fabrics would be perfect for that! My daughter loves brights. I would make something for her. Could use these to include in some finishes! I obsessed with many bags of all kinds so I would saw up some tote bags. Those fabrics are amazing! I have two granddaughters that would love neon anything that I would make for them. I think wide headband/earwarmers would be a great start! A bag,wallet and a scarf for my neons.Beautiful fabrics!! Oooh, a bright little purse would be perfect out these. Just love the contrast of the natural and neon!!! I’d make a diaper clutch for quick trips out with my little guy. Love the neon and linen combo! I am looking for some unique fabric to start my Marcelle Medallion quilt. This looks good. I have purchased from Jones and VanderMeer before. Great service. Fast Shipping. I’d be making a wristlet for my daughter, she’s been nagging for one, and she’d love the neons. Oh lovely! Not the traditional white background for dots. I’m thinking of a very cool Dresden quilt. What a great shop! I’m in love with the Alexander HenrynDimitrious and Martine fabrics! I would make library bags for the grandkids – they would love those neon colors! I think some cute patchwork zipper pouches would be in order with this fabric! love the fabric for lots of things cosmetic bag and travel bags bright and cute! What great fabric. I always make some little gifts for christmas like zip bags – this would be fun to use. What fun girlie neon prints! Maybe totes or bags for my granddaughters. They would be thrilled! Maybe a fun patchwork skirt for my daughter! I am so into bags. So, I would have to use the fabric for a bag! I would make a lovely quilt to add a pop of color to a room! What a lovely selection. The Liberty of London is my favorite. Wish I could see them all in person. Great fabric shop! Love the selection of ribbons. 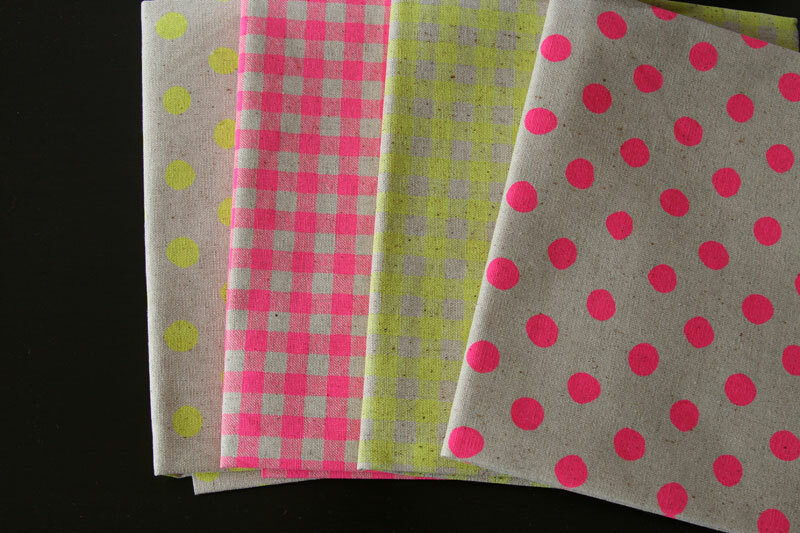 The neon/polka dots would be used for a happy pinwheel quilt for children’s charity…. I’d make a new bag! I can always use a new one, the brighter, the better! I would love to use this to make new bunting for my daughter’s room and for photography backdrops! Pre-teens LOVE neon. I would make mine a little backpack/rucksack for her gym clothes. She’d love it. I’m thinking bags, pouches, electronic gadgetry like ipad or laptop covers, etc. Love to expand the fabric stash every chance I get! A great looking bag with the top fabrics. I LOVE these neons! I would love to make a reversible cross body bag that goes from check to dots! The contrast on the tan linen is so unique! Who doesn’t love a dose of bright ?!? Great finds for sure! I thinks it would make a wonderful picnic blanket with such fun colors! A nappy bag for an up and coming baby! Patchwork tote, no doubt about it. Those fabulous neons are just asking to carry my stuff around and make me look awesome! They’re gorgeous, I love them so much – thanks for the giveaway chance! These are glorious fabrics. I can see so many options for these fabrics; a quilt, curtains for my 5 year old daughter’s room. Love!! I can see these fabrics being used in bags or pouches. Thanks for a great giveaway. I’d make my nieces Christmas present…a quilted trifold cross over wallet..and a few other gifty goodies. The colors are wonderful for the wonky blocks I would like to make. Linen and cotton makes me think cloth napkins. That would be fun and save a few more trees! Just picked up a pattern for fabric buckets …. Think these would be perfect for them! I would make a table runner for the rec room table! I think the fabrics would make a great fun bag. I’m working on a fall themed quilt – the yellow would add a great POP of color. How fun! Love the neons! I’m torn between some new fun pants for my girl (who now refuses her jeans) and another fun quilt. Her birthday is coming! Thanks for the chance. Oh u would make some stuffed bat plushies of course !! Love the neon. I love those neons! I’d love to use them to make a really traditional block with a fluro twist! I think those fabrics would make some super cute dresses for my baby girl, although perhaps I’d need more. A fun skirt would be cute, too. I would make some drawstring bags for gifts or cute zippy pouches! Thank you for the chance to win! I see a quilted tote in my future. Well, a totebag would be a must,and if I had enough, a picnic quilt to match! So fun! Thanks for sharing, Ashley! Great neons! Would make a bright and cheery springtime wall hanging and kindle cover. Love those colors, I think I would make a bag with them. These fabrics are fun! I’d like to make cool placemats and napkins. The Jones & Vandermeer website has lots of great fabric and yarn, too! I am not sure what I would do with them but they are beautiful. I love the neons … thanks for introducing me to this great site. Hi, I would make a flying geese quilt. I love seeing lots of geese in different fabrics flying over a quilt top. Thanks for the offer. 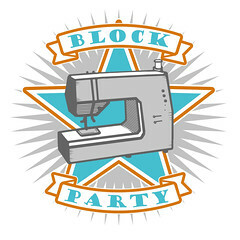 I’d make a baby blocks quilt. These would be perfect for zipper pouches or tissue cases. Thanks for the chance! I’d make a case for my new ipad mini and some zipper pouches. I would probably make some cute little clutches! I haven’t made any in a while so it would be fun to get back to making them! I think I would make zipper pouches for my daughters classmates – for the holiday xchange. Gasp! These are gorgeous. I think I’d use them to make a simple tote bag. Less is more and all that… Thanks for the chance to win! Beautiful fabrics! I have been thinking about homelessness a lot lately. I would use them to make a house-themed quilt to raffle or auction to support affordable housing efforts in my city. The neons would make some fun Easter Basket liners! I would make some awesome doll clothes! Those are amazing fabrics! I would make a tote. Thanks for the chance. Love, love, love these! And I love the shop too! I love those fabrics! I’d use them to make travel/makeup bags for me and friends! Ooh these neon’s are awesome!! I don’t have any plans for them either, but the wheels are turning!! What a great giveaway. Well, I’ve spent the morning working on one of Ayumi Takahashi’s covered lunch totes, using some other nice printed linen, so I need a refill of pretty linen! Plus this bag is about to be given away to a knitter, and I realize I sorely want one for myself!! Those neons are so pretty! I’ve been inspired to learn how to make some hexies and I think they be fab in neon, and then I’d use them to embellish a dress for my Miss! I am working on another breast cancer quilt. These would look lovely in that. I’d make some cute pillows for my niece who’s 10 year old ~ she loves that kind of fabric!!! These would make some great little buckets for storing pretty bows in!